This is my absolute favorite color of blue. I find it to be both soothing and cheerful and I was thrilled when I found these glass beads in a thrift store downtown. 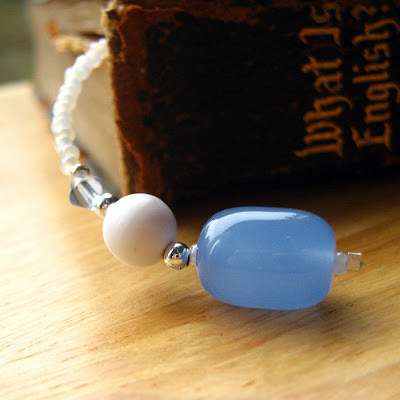 These large cornflower blue glass beads now weigh the ends of this pretty pendulum-style beaded bookmark thong made up of a cheerful but calming blend of seed beads in blue, white and silver. This bookmark's length is 10.75" from tip to tip (27 cm) from tip to tip. Perfect for books, journals and more, our bookmarks are sure to mark your place with your own personal style without damaging book's pages by the commonly used corner-folding methods and we have a number of styles from book hooks to thongs and even a few ribbons!